Copy everything you have in the SD as unlocking the android phone will delete everything you have into it. The steps of the tutorial has been tested on a Nexus S i9023 (SC-LCD) with Android 2.3.4 (original). To determine the version of your Nexus S go to Settings / About phone and watch the first 4 characters that appear in the baseband information. In my case: I9023 XXKD1. When initiates first, if you will not have to install all the packages of all versions of Android (not required for this tutorial) click Cancel in the first message I will. Then, go to Available packages> Third party Add-ons> Google Inc. Select USB Driver Google package and make click Install Selected. Now turn the Nexus S. Connect the USB cable from your phone to your PC and turning it on down the keys left and the Volume Up button, this will start in Bootloader mode Interface. If you do the first time that the Nexus S ROOT and have never played anything like this on the phone, in paragraph LOCK LOCKED STATE will tell. Now, without touching anything on the phone Make sure that Windows has not made ​​a mistake when installing the drivers from the Nexus S, in any case id to Device Manager, you give it to you choose Update Driver, and NOT find the driver on Windows Update, to install it from a specific location on the next screen that you will Marcais the Search for the best driver in these locations (be sure to only checked the Include this location in the search) and search directory you choose as the folder extrasgoogleusb_driver. Click Next and if you install it as Android ADB Interface all be gone, if not, go back and choose the option will choose the driver from a list, if you Android ADB Interface appears as an option to choose, go on and install it, if not, click on Have Disk and seek him in the above directory (extrasgoogleusb_driver). I see a screen with a number of conditions and two options to choose Yes wiggle with the volume keys and selected with the button. NOTE: This will erase all information from your phone and SD card, so be careful with the data loss. When done you should show in paragraph LOCK UNLOCK STATE. Once the tedious steps of the tutorial, we turn to the fun part. The good news here is that the Nexus S eliminates the recovery on every restart of the terminal, making it very difficult to accidentally bricking. To begin recovery of ClockworkMod download from this link http://forum.xda-developers.com/showthread.php?t=988686 (serves both i9020 and i9023 i9020A to) once downloaded to the Tools directory copiadlo your Android SDK installation (in my case "C: programaAndroidandroid-sdktools Files") and as recovery.img renombradlo. We will again use the terminal commands, so you had Open it if not already open (Start / Run: cmd). Once finished choose from the Nexus S Bootloader Reboot option (no dry pulséis Reboot to restart in Android because you crush the recovery and you have just put the factory). NOTE: If instead of telling you that gives you complete successfully an error is that the file is corrupted, so download the file. Img again. Now we have to decide what we do with our Nexus S, if we simply have access to features that require ROOT or if, on the contrary, we want to install a custom ROM. In both cases the procedure is the same, but changed files to use, so I will detail in two separate sections. After restarting the phone Bootloader Reboot option, you go down with the volume keys until the option You select Recovery and the power button. This will start the recovery you have just installed. To access ROOT file should be placed in the external storage of the phone, so first of all you must download the following file your-2.3.6.1-ef-signed.zip . Once downloaded, accessed from the storage and recovery at Mounts and from there you choose the storage option USB Mount, which will mount the device on the PC as if it were a USB memory. Then copy the downloaded file (unpacked) directly into the root of the SD, when copying is complete, eject the storage from the icon next to the clock and you choose Unmount from the recovery. This last step (the recovery) will be returned to the screen Mounts and storage, where it is important to remove all partitions appear, ie, all bearing the Mount option (which indicates that they are removed). Once this check you return back to main menu Go back and you choose the option Install from sdcard zip, within this zip Choose from sdcard you choose and you sail with the volume keys to the file your-2.3.6.1-ef- signed.zip, you must install by clicking on the button and choosing, then the Yes option. When you complete your installation will display the message Install from sdcard complete. Now you can click Go back to the main menu and reboot to reboot system. When initiates Android and will have access and superuser ROOT installed. Installing Terminal Emulator on the phone. Checking if applications get access ROOT. Now you will have to choose which ROM you are going to install on your Nexus S, my main recommendations are CyanogenMod and MIUI (the latter remember to download the language pack unless you want it come out in Chinese and the first download the Google Apps). After downloading the file for the ROM you want to install, accessible from the storage and recovery at Mounts and from there you choose the storage option USB Mount, which will mount the device on the PC as if it were a USB memory. Then copy the downloaded file (unpacked) directly into the root of the SD, when copying is complete, eject the storage from the icon next to the clock and you choose Unmount from the recovery. Once you turn removed the storage back to the main menu Go back and do a Wipe both the Dalvik cache partition as / data and / cache (if any) for it, from the main menu you choose Wipe recovery and You select this option within each of the options mentioned for the wipes. This step is done to avoid incompatibilities between data ROMs having a ROM system to another. This done you return to the main screen you choose Go back and zip Install option from sdcard, within this zip Choose from sdcard you choose and you sail with the volume keys to the file that you have previously downloaded, you must install where clicking on the button and choosing, then the Yes option. When you complete your installation will display the message Install from sdcard complete. If any other zip ROM includes secondary (as a language pack MIUI, or Google Apps CyanogenMod necessary, you can install it by repeating the previous step). Now you can click Go back to the main menu and reboot to reboot system. When reinitiate and will have your favorite custom ROM installed. 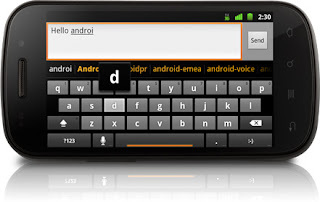 Android 4.0 's 8 innovation!